Two well-known chefs and an industry representative were at a grocery store in Mount Pearl over the weekend to promote the idea that seal is a great source of protein. Two well-known chefs and an industry representative were at a grocery store in Mount Pearl over the weekend to promote the idea that there is more to seal products than just fur, boots, coats or hats. They were pushing the idea that seal is also a great source of protein. 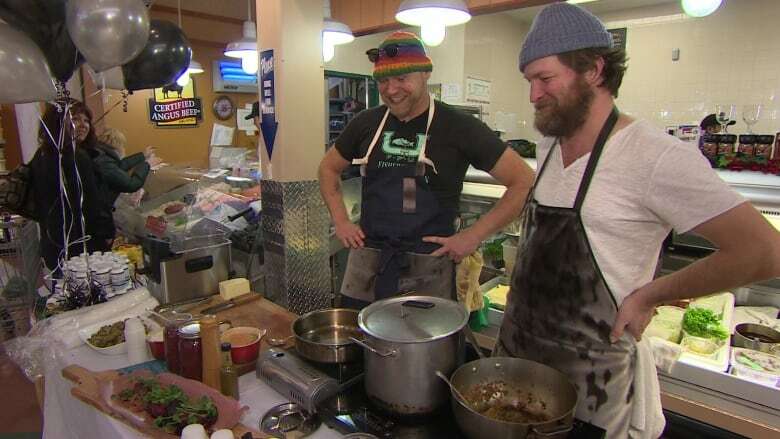 Jeremy Charles, the head chef of Raymonds restaurant, and Todd Perrin, who is chief chef at Mallard Cottage, teamed up to promote the culinary options of seal meat, which is not often cooked locally beyond flipper pie. Perrin and Charles served up seasoned seal jerky pasta, as well as this dish, marinated seal loins. 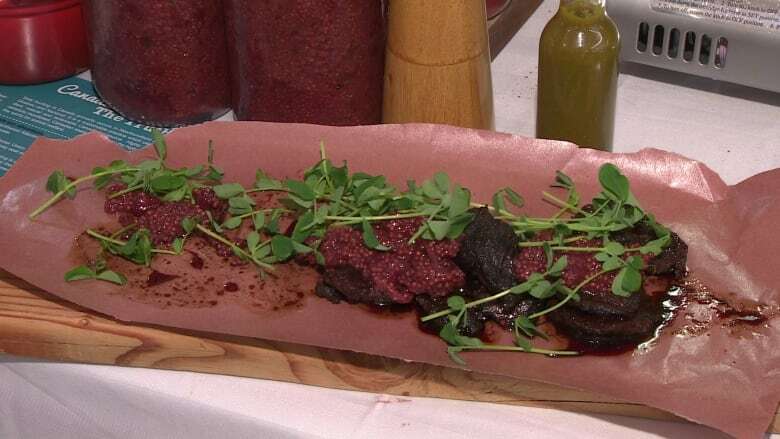 (CBC)Among the dishes cooked up at a demonstration on Saturday were seal loins and pasta seasoned with seal jerky. "It's something that we serve," Charles said. "It's a beautiful, wild, organic and sustainable protein that we have surrounding us." Charles said seal meat is an abundant source of protein that has been overlooked for too long. "It is something that we want to celebrate and showcase and educate people that it is something that we should be eating. It is a beautiful product," he said. The seal industry has taken a beating over the last number of years, with animal welfare groups saying the fur trade is cruel and inhumane and sealers having lost key markets in Europe. "It's propaganda," said Dion Dakins, the chief executive officer of seal processing company Carino. "The leading propaganda by the animal rights groups that want to destroy our industry is that [seal] is simply for fur," said Dakins, adding that that is not the case. Seal has been eaten for generations throughout Newfoundland and Labrador. But without the proper range of seasonings and preparations, seal can come with a taste that isn't for all. "You know it definitely has a unique flavour," said Perrin, as he served up the marinated seal loins — which have a flavour similar to a pork chop. "But I think it's something that hasn't been utilized to its full potential."